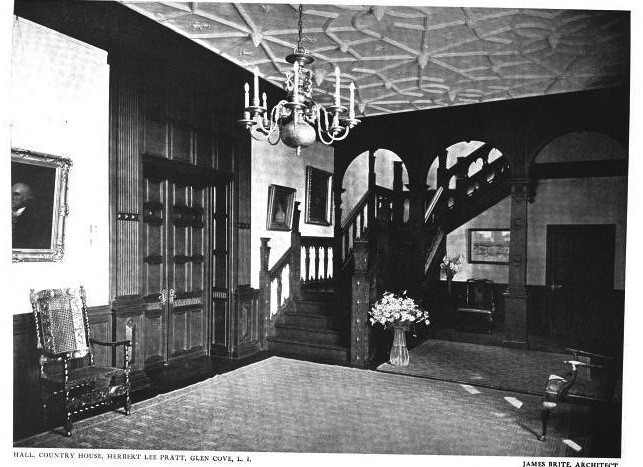 The accompanying interiors to 'The Braes', the Herbert L. Pratt estate designed by Brite & Bacon c. 1912 in Glen Cove. Click HERE for more on 'The Braes'. Staid. Very staid. These are rooms redolent of roast beef, Yorkshire pudding and beheaded wives. Astonishing floor plans. 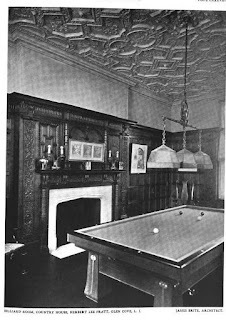 Once again my frustration with Google books is underscored---scanned at such poor resolution that one can't read what interesting specialized purposes all those spaces in the basement are for. Fascinating third floor plan---almost like viewing an ant farm. 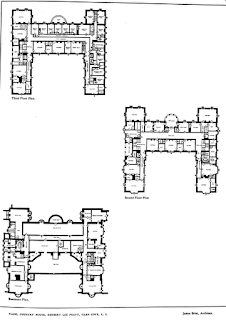 Interesting planning, with the L-shaped range of servant's room and the T-shaped range of master bedroom running, parallel universes separated by a long partition. As one contemplates these plans, one realizes that there are far more bedrooms than most Long Island country houses. Of the plans I've seen, only Oheaka, Caumsett and a select few others have as many or more. One gathers the Pratts gave English style house parties? Take note, Julian Fellowes. Where is Magnus, our expert on all things Pratt? 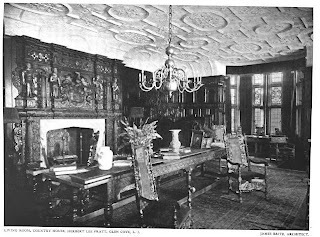 I wonder how many of these historical rooms, woodwork, fixtures and mantels became landfill in the 40's,50's and 60's? what happened to the 1st floor plan? can anyone else see it on here? The B, 2nd & 3rd are woefully tiny but the 1st is completely gone on my screen. Wonder what the fate of those beautiful original wrought-iron entrance gates. 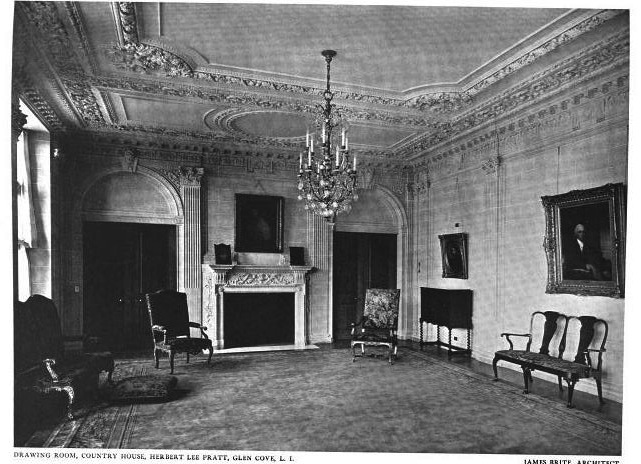 These period room wound up in various places. Some went into movie theatres, some became sets for movie studios, some were preserved in museums - others were used in hotels, public buildings, but more than we would like to believe probably ended up in the dump. 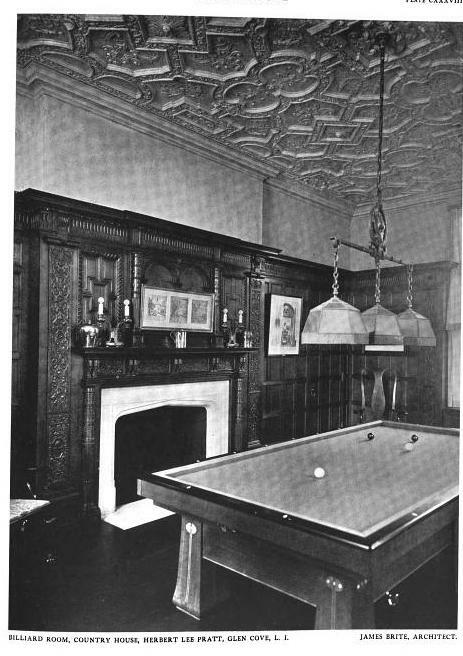 Notice the very modern billiards table. Can't you easily see Rex Mottram lining up his shot? A gorgeous property and still with us. The expansive floor plans are a real treat to see. Does anyone know how to enlarge the plans without totally losing all resolution? 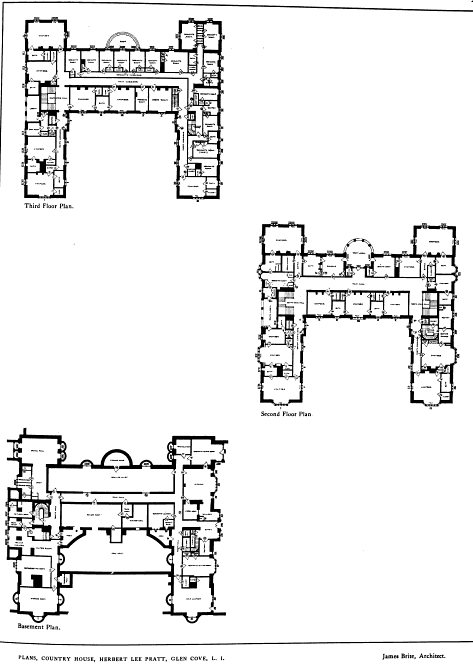 Those floorplans are hugely intriguing-and hugely frustrating. 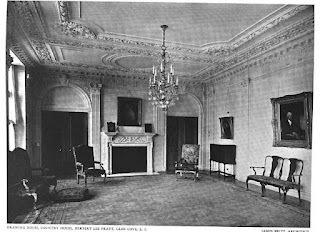 Perhaps it's in DED's link, which I can't open at the moment- but I remember reading that Duveen initially offered the Rotherwas panelling to Hearst (I think at the astronomical price of $250,000), Hearst very uncharacteristically dithered and Pratt jumped in. 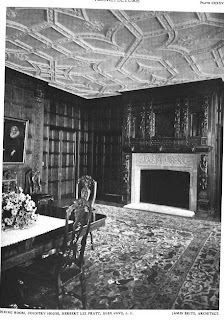 Herbert Pratt seems to have been the family's collector (American and English portraits, miniatures and silver, primarily), much of the better stuff now at Amherst or the Metropolitan. Years ago, I spoke to the curator of the Amherst museum to get a better sense of what Pratt had left them. I told her that my initial interest stemmed from an interest in the Gibb family, of whom Herbert's wife, Florence Gibb Pratt was a member. 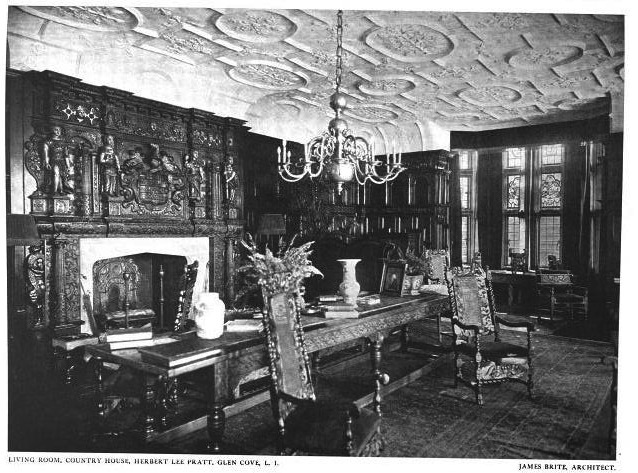 The curator laughed and told me that she had never known Mrs. Pratt's first name: in the voluminous archives relating to the collection in the Amherst archives, everyone, including her husband, refer to her as "Mrs. Pratt", and in the correspondence they have from her, she signs herself "Mrs. Pratt". It seems to confirm the only first hand account I have of her- from a young niece who described her as "frosty".